I know many of you don’t really know me, and this article isn’t about me; however, in praising my God, I’d like to give you a glimpse of who I am and how my heart and mind works! We are on vacation, which hasn’t really happened in two years due to recitals and graduations and weddings. (My husband would remind me that we were away from home, and that’s a vacation; but I would remind him of the scheduled events and the harried pace we were keeping—not a vacation mode!) 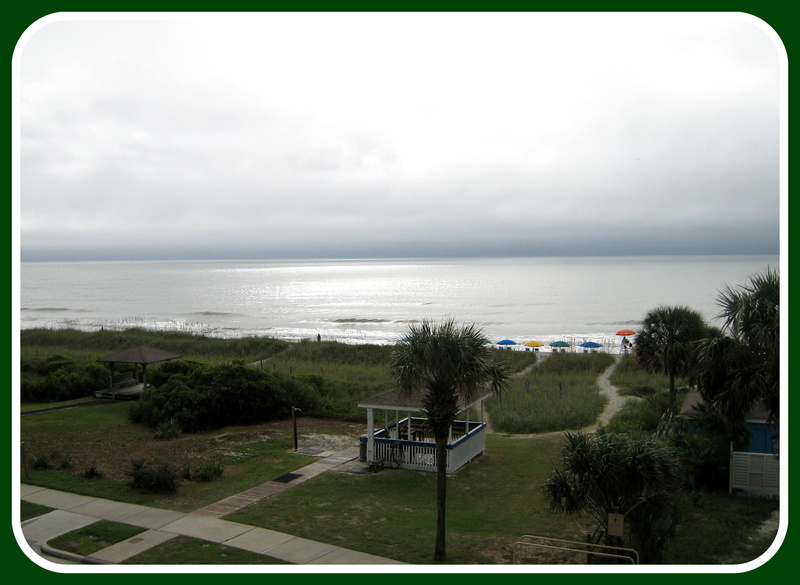 This vacation at Myrtle Beach was directed by our son and his wife’s residence in Columbia, SC. After their departure from PA in July, mama-bear was ready to see her baby cub! As usual, I did the preliminary hunting for a place and was pleasantly surprised at the prices and selection having never been here before. Sixty miles of beach–WOW! So, we booked a place and for the first time since our honeymoon, dear hubby and I are alone for FIVE nights! And although we think of our children and grandchildren often—thinking about how much they would love this—Tom still has me to squeal with delight and act like a kid! I’m loving life! Our room was very nice. It had a few issues, but it was clean and comfortable, and the people were wonderful; however, when our TV died and the DVD player didn’t work, we were a bit disappointed. We wouldn’t normally watch a lot of TV, but it has rained for three days straight! When the technician couldn’t get the new DVD player to work, a call came from the desk: Sorry for the inconvenience; would we rather a discount and no TV, or an upgrade? We took the upgrade, and I’m now sitting in a beautiful room with full length windows on two sides of the living room, a balcony off the bedroom, and another balcony off the dining area overlooking the pool, whirlpool, and lazy river! Now unto Him that is able to do exceeding abundantly above all that we ask or think!!! I just want to praise our awesome God for turning a very minor inconvenience into a beautiful blessing! Isn’t it often the case: The trials, albeit small, start stacking up, and like the “little foxes that spoil the vines” (Song of Solomon 2:15), they slowly try to steal our joy. The temptation is to pout and complain. Why all the rain, God? You could make the sun shine? We haven’t seen the sunrise yet, Lord! You know how much we love to enjoy the ocean! We serve You faithfully all year long—two years long! Who ever heard of three straight days of rain in South Carolina? Don’t we deserve sunshine? The answer is, “NO!” We don’t deserve anything but hell! That may sound a bit harsh, but it is true. We get so focused on our little piece of the world, that we forget how big and awesome and perfect and all-knowing and all-loving our God is. He knows just what we need: three (actually, it looks like it may be four!) days of rain! Is He testing our patience? Probably. Does He want to see how we’ll react? He already knows! He wants us to see how we will react!!! I’d like to say that we haven’t been disappointed, but that wouldn’t be true. Spoiled brats! I just want to praise Him for His PERFECT way!